The UK will stand "shoulder to shoulder" with the United States in "defeating the evil of terrorism", Theresa May has told Donald Trump, after eight people were killed when a pick-up truck ploughed into pedestrians and cyclists on a New York bike path. Five friends from Argentina celebrating the 30th anniversary of their graduation were among those killed in the deadliest terror attack to strike New York since the September 11 atrocity in 2001. Police said the attack was carried out in the name of the Islamic State (IS) terror group, also known as Isis. The US president has ordered the security services to "step up" vetting procedures following the attack on Tuesday afternoon. In a phone call with the president, the Prime Minister said she was "deeply shocked and saddened by the loss of life", a Downing Street spokesman said. "She reiterated that the UK will continue to stand shoulder to shoulder with the United States in defeating the evil of terrorism." The two leaders also discussed the need for an international approach to tackling "poisonous terrorist ideology" online. 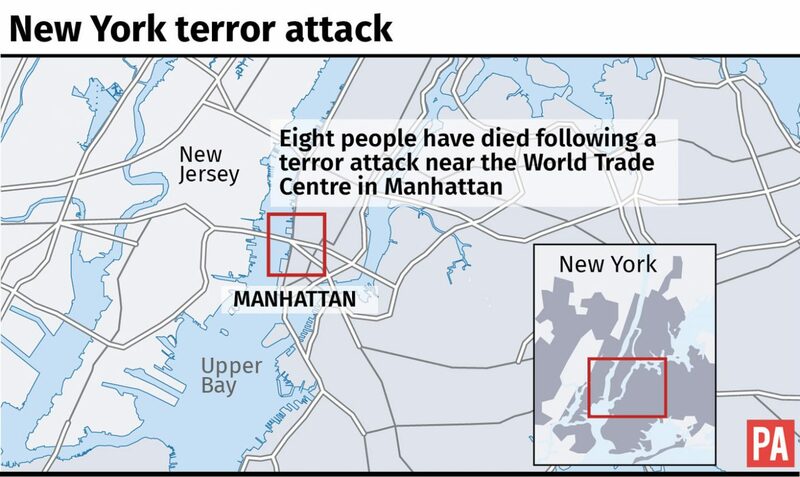 The attack, near the site of the World Trade Centre memorial, left 12 people injured, according to officials. 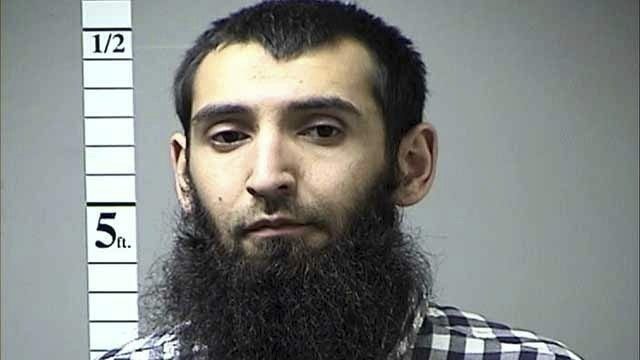 The driver, who has been identified by law enforcement officials as Sayfullo Saipov, 29, from Uzbekistan, was shot by police after jumping out of the rented vehicle with what turned out to be two fake guns. John Miller, deputy police commissioner for intelligence, said Saipov left behind notes at the scene, handwritten in Arabic with symbols and words, that essentially said IS "would endure forever". "It appears that Mr Saipov had been planning this for a number of weeks. He did this in the name of Isis (another name for IS)," Mr Miller said, citing the notes. Argentina's foreign ministry said Hernan Diego Mendoza, Diego Enrique Angelini, Alejandro Damian Pagnucco, Ariel Erlij and Hernan Ferruchi had died in the terrorist outrage. The group were marking three decades since their graduation from polytechnic college in the city of Rosario in central Argentina. A Belgian national was also among the dead, the country's deputy prime minister said. New York mayor Bill de Blasio described the attack as "a particularly cowardly act of terror" that was "aimed at innocent civilians going about their daily lives". The 29-year-old suspect had been working as an Uber driver after passing a background check, according to a spokeswoman for the app. In a statement, the firm added: "We are horrified by this senseless act of violence. "Our hearts are with the victims and their families. We have reached out to law enforcement to provide our full assistance." President Trump said he had ordered the Department of Homeland Security to step up its already "extreme vetting" programme, adding: "Being politically correct is fine, but not for this!" The US president also tweeted: "We must not allow ISIS to return, or enter, our country after defeating them in the Middle East and elsewhere. Enough!" Irish premier Leo Varadkar said the attack was vicious and heartless. "Those who have been killed and injured were innocent victims going about their day, completely unaware of what was about to happen," he said. "I would like to express our solidarity with New Yorkers, who have faced considerable adversity in the past. Our thoughts and prayers are with the families and friends of the victims."